For those of you that are regulars you will all know about the problems i have had in my mobile station over the last fortnight and for anyone who is here at ham radio for the first time,hello and welcome to my web blog. After operating all week from the mobile on the recently fitted ft-857 I was now missing my old friend the ft-100 which was suffering with a locked up solid vfo with no easy way to tune up or down. So I struggled all week on the ft-857 that seems to not be able to blank out the rfi from the engine too well but still made a couple of QSOs on 20m, 40m, and 2m asking for a audio reports. The Old ft-100 in this case is better than the new ft-857 on Receive, Audio quality,and overall performance on HF and FM. As for the ft-857, is easy to use and looks good but that's about it, as soon as the FT-100 gets back in its right full place the better. Well, Karl G1YPQ got it right when in qso he was telling me that I did not sound as clear as usual despite trying numerous settings. "You would have thought that they would have taken the good bits that worked so well on the ft-100, and put them together with new improved technology then put it all in the box of a new ft-857 to produced an even better rig. But instead it seems that something did not quite go as planned, as the old rig seems to out perform the new one". I agree with Karl and that's why I got on the telephone and spoke to some very helpful people at YAESU UK Limited, and was able to order a replacement rotary encoder (vfo) for the ft-100 at a total cost of £18.49. The service from yaesu uk was fantastic, friendly and knowledgeable and I ordered the part early Friday morning receiving it early Saturday morning, that's very fast for U.K. I was highly delighted to be on my way back to operating the ft-100 from the mobile as soon as the vfo transplant was completed. I decided to take some pictures to show how simple the task really was and the total time that the job took was less than 15 minuets. Rotary Encoder courtesy of Yaesu UK limited cost £18.49. next day delivery. Pull all the knobs off by hand, use a small allen key to unlock vfo nob after the rubber grip has been removed. Remove the two screws from the rear panel of the head unit. Gently prize the the back panel open and separate. Flip up the plastic clip that the tape power lead is plugged in, allowing it to be gently removed and separated. Unscrew the brass locking nuts on the front panel nobs and vfo. The radio head mother board will now detach and allow access to the board. The damaged vfo rotary encoder is in view and still connected. Unclip the white connecting plug to detach. All parts can be re-assembled by carrying out the above in reverse, and more important,all fully functioning again ready for me to try wear it out again. So a happy ending for the favorite rig of mine, I shall be fitting it back in the Toyota tomorrow curing all rfi and noise problems with the radios superior noise blanker, putting the ft-857 back in the home shack where it gets used for satellite tracking and to be fair it does an excellent job. All ends well in this scenario and as a result of changing things around i decided to swap the QTH shack around some more, so I can work on the HF bands on my other older rig the ft-767gx with the MD-1, giving the ft-847 a break for a while from HF but trying it on vhf instead. I guess i shall be mentioning any noticeable results in the near future, but until the next post its 73 and all the best from Simon 2E0HTS Baildon Moor, Yorkshire, in the North of England. I managed some good reports today whilst driving too and from my works QTH. At about 7.15 utc I worked into the Azores on 40m from the ft-857 with 50watts into a maldol hfc40 mono band antenna. I was given a 5/6 report which was well received at 5/9, I then tuned to 20m and switched to the hfc 20, where I managed a 5/9 into Italy just as I was arriving at work. The best report of all came on my home bound journey at around 15.45 utc from Gary EW1MM on 14.174mhz who I have made QSO with many times from my mobile, my home station, and at the STAR Centre. Gary gave me a super critical report of sounding sharp and clear with a very occasional clip on the odd word.As soon as I was stationary I reduced the ssb mic gain down from 40 to 30. I will see how that setting works and hopefully it will be a true 5/9 if I can manage to refain from shouting into the mic, I have constant reminders from Louise that I can get quite loud when struglin to get through the QRM whilst in QSO. You no what its like when you get excited. As far as the QRN I mentioned last time, the noise is only present on 14mhz whilst the engine is running, and when operating on 7mhz there is no noise what so ever. The next experiment will be re-routing of the coax to the 20m antenna mount, and I shall also check the mount ensuring a good earth to the chassis is still present. But first, probably tomorrow morning I will exchange the 20m antenna to the mount of 40m antenna to see whether this eliminates the noise on 20m, if not I shall be trouble shooting as mentioned. I would be grateful of any ideas and help, perhaps you have experienced something similar, if you have a few moments spare maybe you could comment with a magic cure that makes the rfi created by the engine disappear? I have worn out the VFO on the magnificent little ft-100 that has served me well in my mobile. The rig works fine apart from the actual vfo that has now locked up which makes it awkward tuning around the bands using the select knob and mic buttons instead of the vfo, and of course driving at the same time. After trying to operate this way for a couple of days, I soon decided to take the ft-100 out of the vehicle and exchange it for the ft-857 from the shack at my QTH. The ft-100 will be ok interfaced to the p.c where my mouse, keypad, and screen control my rig. I will send off at the same time to yaesu UK and hopefully obtain a replacement VFO which looks fairly simple to install. In the meantime I have been running the two rigs in reverse rolls, I am just about getting used to the changes in my mobile. I am not sure about the ft-857 on 20M or 40M as I have only had a couple of QSOs on each band so far, but apart from the electrical noise picked up from my Toyota Rav4 all is well. The ft-100 seemed to have a better resistance to QRN created from the vehicle ignition system unlike this more modern ft-857. The ft-857 has a more pleasant sound through the same ext speaker especially when the engine is no longer running. I fitted an RFI choke close to the battery and another near the rig so hopefully time will tell of how the rig truly performs in the mobile after such an impressive predecessor the ft-100. 73 and if you hear me on I'd appreciate a report. 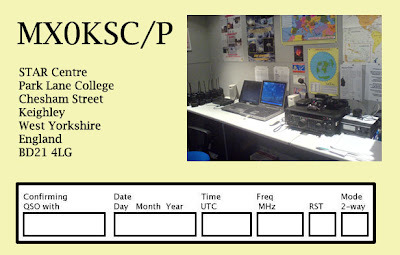 MX0KSC is the Call Sign of the Keighley STAR Centre which is part of park Lane College Keighley. The Station has been active for around three years and was set up to promote Science, Technology, and Maths using the theme of space to inspire learning.The shack is found along side a mock space craft, mission control, laboratry and mars landscape all located in the STAR Centre. Since the project started over 2000 students aged 6years to 86 years have visited the STAR Centre and experienced the Radio Comms Shack of MX0KSC and as previously mentioned, many scouts have gained radio communicator badges and some Air Cadets have recently passed their exam and now own foundation licences to operate Amateur Radio. 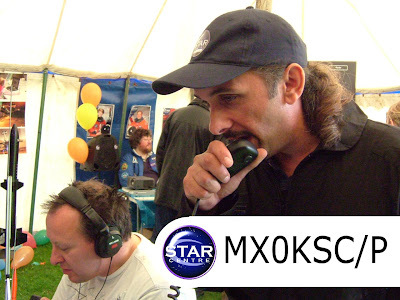 MX0KSC usually operates During the week days or evenings and sometimes Saturdays whilst engaged in training and learning, also on special events such as JOTA, TDOTA, Scout Camps, National science week and Keighley show. The Club station is run by , Louise M3TLL, Phil M1PAC, Barry 2E0OOC and myself Simon 2E0HTS as well as our fellow licenced club members. When you hear us on the bands, we are often in the company of the public, school children, college students and uniformed organisations such as Scouts Guides and Cadets, So if you hear us get ready for a big audience in the shack and maybe a few questions from the students/audience. Here are the QSL Cards that you are likely to receive when we are operating the college club station MX0KSC. We hope that we will be filling in your Call sign on the back of this. Samuel Finley Breese Morse was born on April 27, 1791, in Charlestown, Boston, Massachusetts. He was the son of Jedidiah Morse, a pastor. Samuel Morse trained as an artist and worked as a portrait painter until the 1830s. However, today Morse is remembered for inventing the electric telegraph and the related code system known as Morse Code in 1837. In 1832, while returning from a period of art study in Europe on the ship Sully, Morse overheard a conversation about the newly discovered electromagnet and came up with the idea of an electric telegraph. The electric telegraph was basically an electrical circuit made up of a battery, a key, and an electromagnet, all connected by wire. The battery created electricity that travelled along the wire. The key, at one end of the wire, was pressed down to complete the electrical circuit. The electromagnet, at the other end of the wire, had a pencil attached to it, which moved and made a mark on a paper tape whenever the electric current passed through it. The marks were short or long, depending on how long the key was held down, which led Morse to develop a code of dots and dashes that corresponded to each letter of the alphabet. In 1840 Morse patented his new code that used combinations of dots and dashes to represent all 26 letters in the alphabet and numbers from 1 to 10. This code, known as Morse code was developed to use over telegraph wires, he was not trying to make a secret code, he wanted a code that could be used easily by many people. Morse code is arranged for the easiest possible use. As E is the most frequently used letter in the English alphabet, Morse gave it the shortest sound – a single dot. T is the next most frequently used letter and it has the next shortest sound – a single dash. 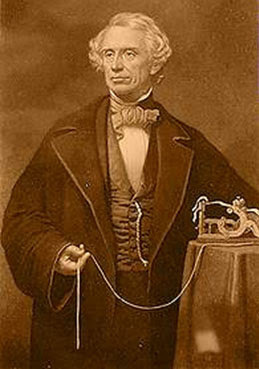 In 1843, Morse secured funds from Congress to construct the first telegraph line in the U. S. from Baltimore to Washington D.C. Then on May 24, 1844, from the Capitol building in Washington, Morse sent a Biblical quotation as the first message on the line to Baltimore: "What Hath God Wrought!" In April 1845, the line was opened for public business under the control of the US Post Office. One cent for every four characters was charged. During the first four days, one cent was received. By the end of the week, the receipts had risen to one dollar. Morse had developed what was to become a popular and successful method of communication. An advantage of the Morse is that you could hear the signal arrive meant trained operators could translate incoming messages as fast as they could be sent. Morse’s original code was the sound of long and short clicks but the code you hear now is long and short beeps. The Morse Code alphabet we use today is known as Modern International Morse code and was invented by Friedrich Clemens Gerke in 1848. Morse died of pneumonia in New York City on April 2, 1872, at the age of 80. He is buried in Brooklyn's Greenwood Cemetery. Morse Code is now not in popular use, however there are many marine radio operators and soldiers with a knowledge of Morse and the code is still used by radio amateurs around the world. It can still provided a way of getting urgent messages through by lights or flashing mirrors - or when other communications systems break down. Whatever the case, dot dot dot, dash dash dash, dot dot dot is still widely recognised as 'S-O-S' - and one day, that might just save your life. We know Morse as dot dot and dash dash, but operators are trained to say 'Di di' and 'dah dah'. Morse code can be a “sound” code by tapping with pencils, snapping fingers, or blowing whistles. It can be a “sight” code by waving flags, flashing lights or moving items slowly or quickly. Morse is very useful as it can be heard when other signals may be too weak to be heard. Morse Code is also known as CW or Continuous/Carrior Wave which is the type of wave used to transmit Morse Code. I hope you like the new blog look that Louise has found me. The past week has been very busy at the College where I work.There are many new Students starting new courses in various Vocational subjects. Its the one of the busiest times so you can imagine I am running around trying to remember everyones names. I am looking forward to seeing these young learners progress and succeed and at the moment its good to see some good behavior and enthusiasm from young learners. As you may have guessed it has not been so easy to play radio the last few evenings. I have been riding the recently purchased Kawasaki 750 to work due to the good weather lasting, so working mobile has been limited.Its been fun and also saved me a fortune on petrol. This Thursday evening I am gonna be in the STAR Centre with Louise M3TLL, we will be helping a group of Ranger Scouts learn a bit more about radio and propagation with the aid of the Centres Radio Communication shack situated next to the MARS Landscape. It should be a good night and the course will be in two parts so i get to do some more in a fortnight. I shall probably have more to say in the near future. Coming up in OCTOBER on Saturday the 20th will be Jamboree on The Air where we usually have Cubs and Scouts visiting from West and North Yorkshire. I will be mainly on the HF Bands, 80m,40m and 20m from 9-4pm with my own callsign and hopefully we will operate MX0KSC once i get conformation that my fellow club mate Phil M1PAC can attend. I shall attempt to call CQ on 2m in the hope that we hear another local Scout station as previous calling on 145.500 has proved to be a rare thing when any response is heard from well received local amateurs. I am always happy to speak with distant amateurs who take the time to quickly say a few friendly words to the students in the shack, this always puts a smile on all who are in the vicinity of the Yaesu FT 1000 mp mkV. This rig is the same one used in the video of MX0KSC/p and has performed well up until the minor fault we had the other week,but seems good now. The students often log many other stations and usually i try to split each group up giving them all certain tasks to do with a 30 minuet time span encouraging each group to compete against the other. This usually results in hundreds of Radio Amateur and broadcast stations been logged and found on the many bands using the rigs and receivers in the facility during the day. Its usually a good fun day for all. that's it for now and hopefully ill be more active on the bands in the up and coming days. So if you hear me give me a shout or just say hello. 73 all the best Simon. Hi again from 2e0hts, This weeks radio activity has mainly been on HF from my radio shack and earlier in the week I managed to also make an Internet QSO with my blog friend JN4VWH Nash in Japan. I made the contact for the first time with Nash with the help of msn messenger, this was fun and helped us to arrange a radio sked which we tryed on 7mhz, 18mhz and 21mhz without success. However I then decided to interface the radio to the computer and managed to allow Nash JN4VWH to receive my radios incoming signals via the msn system. I then set the monitor level on the rig which allowed my audio to be also heard through msn each time i transmitted on the air. So Nash could hear myself and any stations that i was working on HF, allowing him to know what was going on here in North England. Fortunately the bands were very busy and I made many QSOs on 20m, 40m, and 80m, I also mentioned to some of the Stations worked that Nash JN4VWH was in SWL mode via my radio and p.c. The stations I spoke with were highly amused and sent greetings messages to Nash and i received Internet msn message back allowing me to pass them back to the other operators i was working. This was quite an interesting experience and I am looking forward to trying it again when i catch up with Nash on msn messenger, and hopefully we will make a HF contact next time if the propagation is good.To do this i ran a lead from the ext speaker of the rig to the line in or mic in on the p.c. soundcard. I then selected the voice conversation option on msn but used the radio rather than a p.c mic, it is simple but effective. which some how previously managed not so well to deflect RF from the little ft-857 that we used at the same time on another band. Whoops and what a load of rubbish were the thoughts that I had as my older rigs at home can run on different bands whilst playing psk31 on 14mhz and talking on another band at the same time without Even a flicker. I suppose the modern technology is great but also very fragile as compared with the older robust heavy duty ft767gx still in perfect working condition 20 years on. Well where was I ? oh yes the Worked All Europe Contest, this was the best way I could test the ft1000 and after picking it up Saturday lunch time i was keen to connect to my antennas situated high up on the moor top. I was even more happy to work three new countries which included Saudi Arabia, Indonesia and Kuwait all worked with 50watts through the hustler 6btv on 20m.I have spoken with Saudi Arabia and recieved a QSL from my mobile also Kuwait but this was the first time from my Base Station. I went on to work the same Kuwait station again on 40m with my G5RV, twice in one day, same contest that's pretty good going! So i guess the radio is working just fine, Thanks to Steve from LARS the STAR Centre can continue to enjoy this radio as a teaching aid and as I am the STAR Centre Station Manager you guessed it, there is a big grin on my face, know that we have our toy back. I was on the Air during the contest for a couple of hours and I gave a few points away to Stations outside of Europe working around 30 Contest Stations. 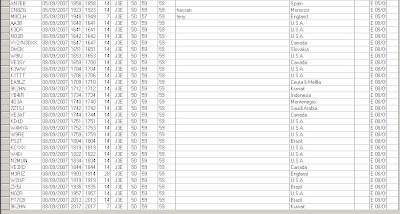 You can see who and where I worked on my log, if your on it thanks very much see you again next Contest. Today I was active alongside Louise(M3TLL) and Phil(M1PAC) and other colleagues from my Workplace which is Park lane College Keighley. 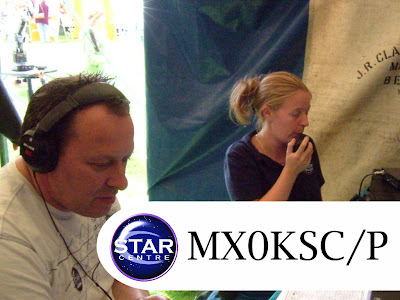 We were operating the STAR Centre Club Station which is part of the College and the Call Sign is MX0KSC which stands for MX0(ENGLISH CLUB STATION) and KSC(KEIGHLEY STAR CENTRE). The Location of our portable Station was at the grounds of The Keighley Agricultural Show, at Marley Stadium Keighley West Yorkshire in the North of England. The Videos below show our Station in Action. We had a fantastic Day and I managed to test the new portable Hustler 6btv antenna system recently mentioned in this blog with an amazing first QSO of the day with JA7NVF from Japan. So I guess you could say that the new antenna and home brew mounting bracket is working just fine. 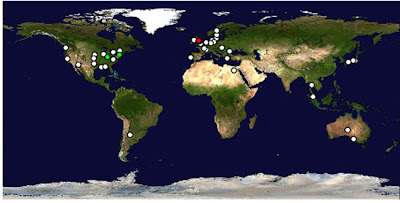 During the event we made contact with 58 stations from all around the World and all over over the U.K. We operated 40m,20m,2m on phone and some SSTV and PSK31 on 20M.The HF Bands were busy with lots of activity as there were at least 3 different Contests going on, however it was no surprise to find 2m to be dead with very few takers. The antenna stood out in the crowded show ground attracting many Radio hams whom we had the pleasure of meeting,We met 2 G0 stations from the local area of Keighley and we were also visited by 2E0PMM, G8IC, and G0GNU. We had at least 200 other visitors into our marquee with all ages Boys,Girls,Ladies and Gents. There was no shortage of interest and enthusiasm regarding radio and 3 young Ladys operated the Station making lots of QSO for the very first time, in fact they stayed in the marquee for almost 2 hours. The other STAR Centre staff had some interesting things like Rockets, Robots, Laptops and Space related things for the public to check out. The whole event was a big success and the Agricultural Show was very busy with lots of Stalls, and events which included Horse Show jumping as well as pet show competitions and other interesting Show Ground stands. Fortunately the weather was good, I am looking forward to next years event. A big thank you to all Stations that we worked under the Call Sign MX0KSC/p and also I worked quite a few as I was setting up under My home Call which as you know already is 2E0HTS/p. Also thanks to Phil(M1PAC) who is a Club Member and Volunteer for the Colleges STAR Centre and He also holds the Club Call Sign MX0KSC.